This M9 Bayonet Display Stand is perfect for your M9 Bayonet. 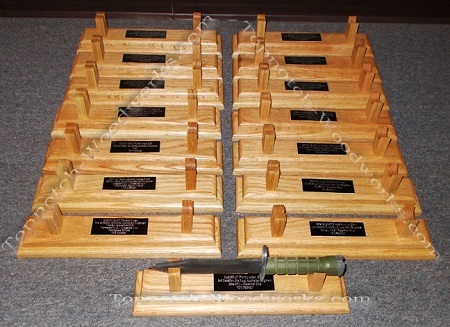 The M9 Bayonet Display Stand is made from solid oak. This M9 Bayonet Display Stand / Coin Stand is perfect for your M9 Bayonet and approximately 10 coins total, displayed on both sides. The M9 Bayonet Stand is made from solid oak. Established 2004 Topnotch Woodworks. All Rights Reserved. © 2019 Topnotch Woodworks · Built by MePush.